However, today I came across a calculated field that had been setup in our system by another developer, the field was simple enough it was calculating the end date of a contract when given the start date and length in months. 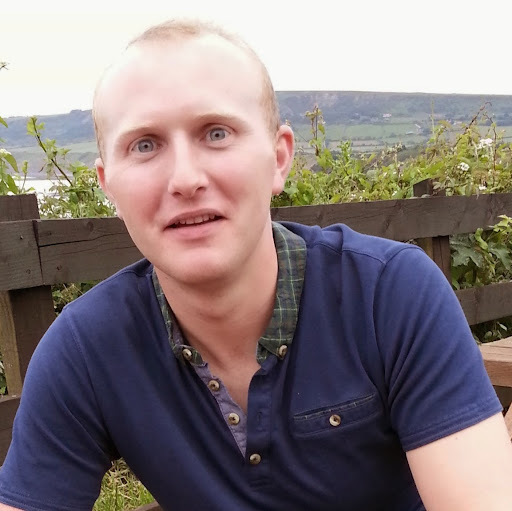 The calculation has been working fine however, the problem arose when our customer wanted a modification to give them the ability to override the calculation in certain scenarios. 1.) 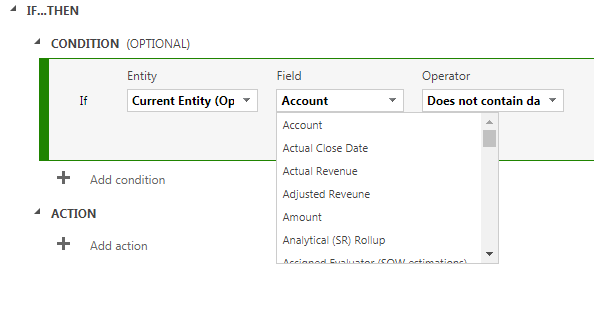 Modify calculation to only calculate if the field is null - At first I thought I could wrap the calculation in a condition to only perform the calculation if the end date field was null. However, Microsoft prevent you from selecting the current field in the list. I.E. having a condition on the same field as the calculated field. I guess it kind of makes sense to ensure no circular references. 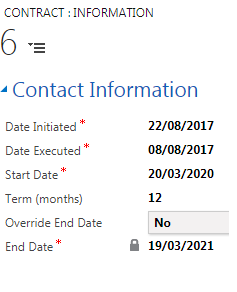 To achieve this functionality I created a new "End Date" field and used the above boolean override field to set whether the field was editable or not. If the boolean override field was set to false the end date was calculated. I took advantage of the brilliant moment.js library to help peform the date calculations. The below screenshot shows the UI with the field locked and date calculated as expected. A simple solution in the end but thought I would blog it in case it saves someone else sometime. it just goes to show things are not always as straight forward as you think they should be. Maybe Microsoft will give us something out of the box in future releases.